SOLD Approximately 17" x 5.5". 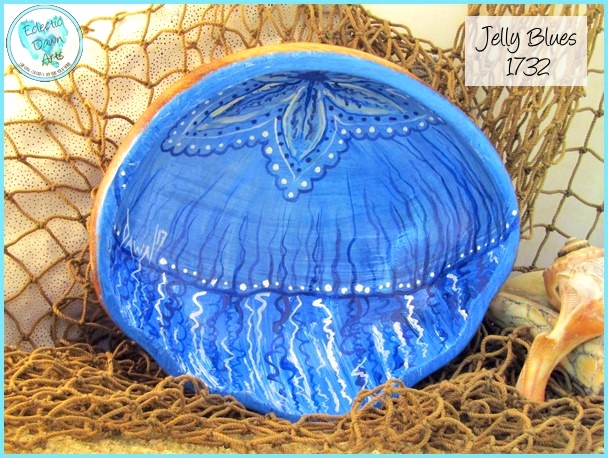 The wood has a lovely dark patina accented by the deep blue and black swirls and dots pattern. Very lightly inscribed on one end of the back are the words, "Made in Haiti", and we are not sure of the wood type. 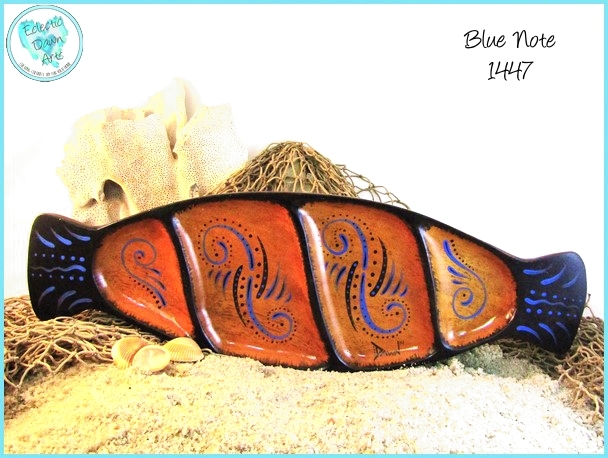 TB1447 "Blue Note". Not food safe, clean with damp cloth, not for dishwasher. 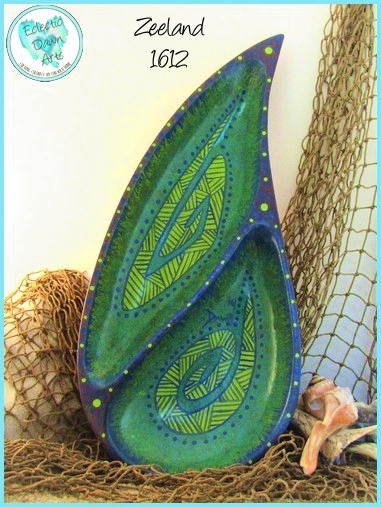 "Zeeland" (accessories not included) - TB1612 - ~10" x 10" - A sleek modern shape brings vivid energy in its sweeping form to your table or counter. A fine addition to a vintage style tiki bar, with a colorful take on aboriginal crosshatching techniques. 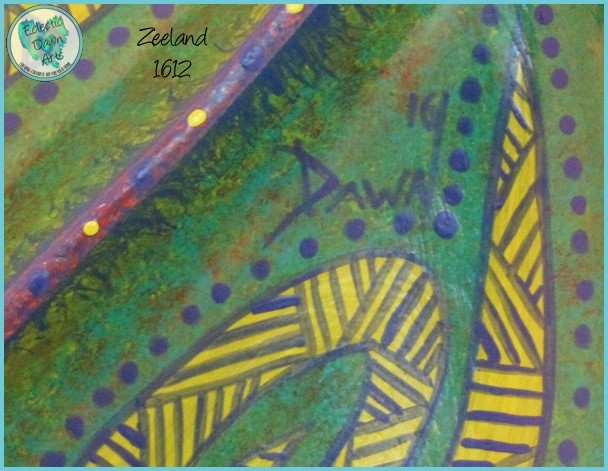 This piece is an abstract representation of the two islands of "Zeeland". Zeeland is the name of the westernmost province of the Netherlands, but this represents the islands in the southwest Pacific. In 1645, Dutch cartographers renamed the two islands then known as "Staten Landt" to "Nova Zeelandia" after the Dutch province. Capt. Cook later Anglicized that name to New Zealand. There are actually two names for the separate #islands, in English and Maori: North Island (Te Ika-a-Māui) and South Island (Te Waipounamu). Free shipping. NOT FOOD SAFE, clean with damp cloth, do not put in dishwasher. 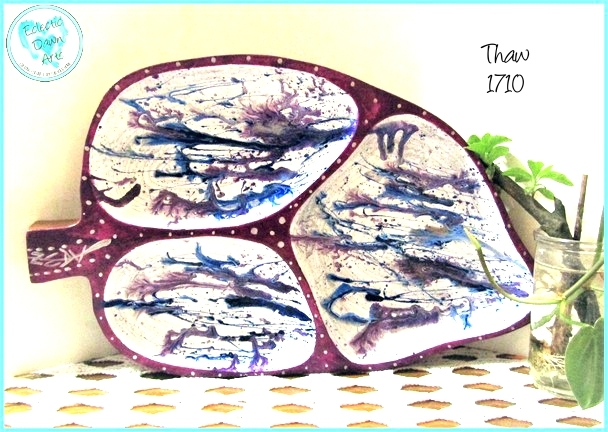 "Nautomic" (accessories not included) - TB1615 - ~12" x 6 1/2" shallow tray (sizes are approximate) - Bring a unique touch of Atomic Mod to your home with this abstract atomic art piece, "Nautomic". 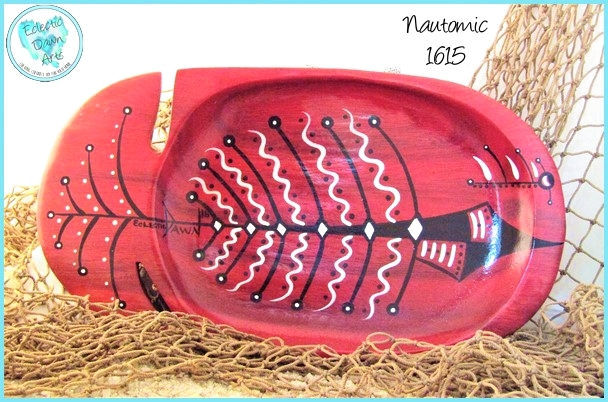 Simple geometric lines in black and white on a red background bring this Atomic style fish tray to life! Free shipping. NOT FOOD SAFE, clean with damp cloth, do not put in dishwasher. 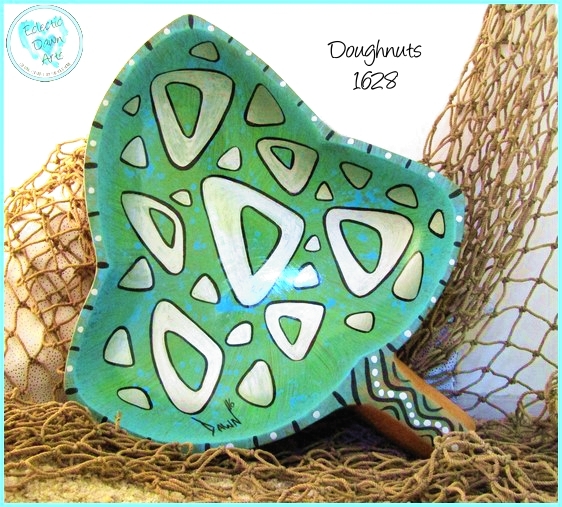 "Doughnuts" (accessories not included) - TB1628 - MidMod Abstract Bowl - ~9.5" x 8" 3-point leaf shape - If you love atomic mid-century art, then this updated energetic piece will fit nicely in your home! This is a geometric abstract look at atomic doughnuts, with a colorful background (green into aqua/turquoise), and metallic silver triangle "doughnuts" and doughnut "holes." Free shipping. Not food safe, clean with damp cloth, do not put in dishwasher. 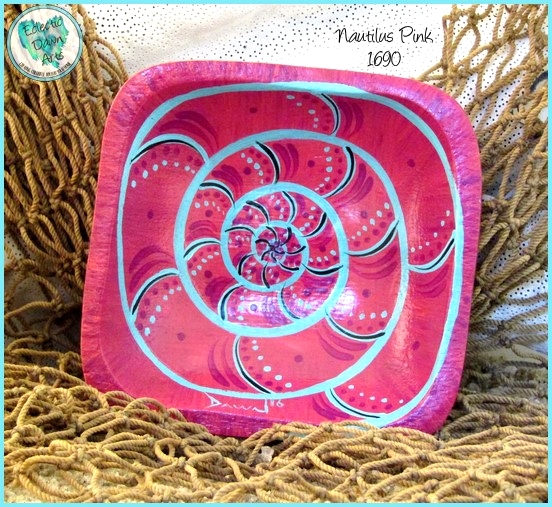 'Nautilus Pink' Trinket Tray, Ring Holder, or Decorative Bowl TB1690 (accessories not included). ~4 inch square. 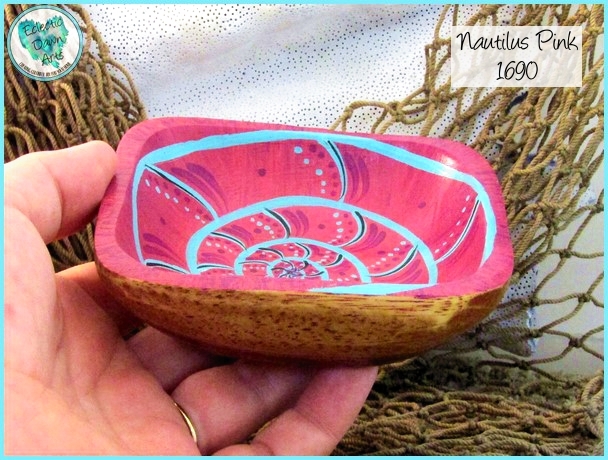 This diminutive shallow bowl, hand painted with a stylized nautilus design, makes a great holder for rings and or other tiny things at the end of the day. 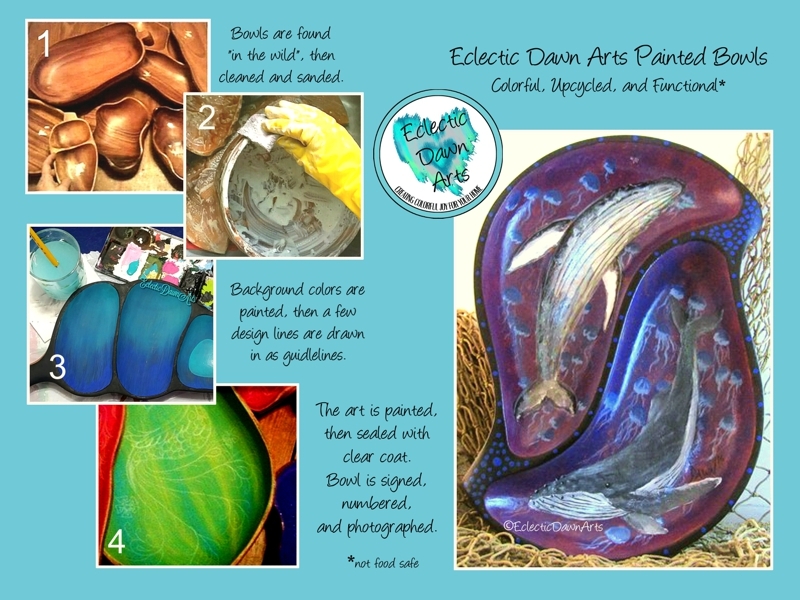 A lovely gift for someone special, a splash of color to brighten anyone's day. Free shipping. Not food safe, clean with damp cloth, do not put in dishwasher. 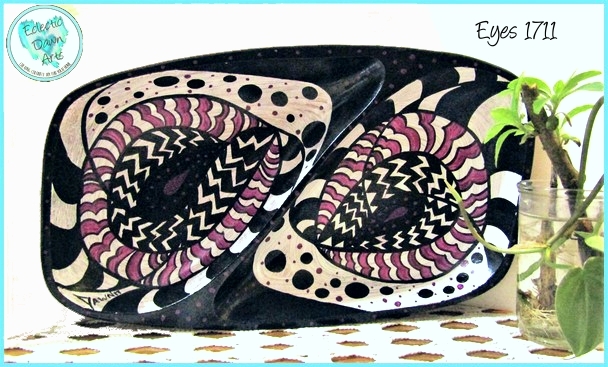 #TB1710: 'Thaw' Trinket Tray or Decorative Bowl (accessories not included), ~12.5 x 7.5 inch, 3-section leaf shape (sizes are approximate). A blending of blues and purples, along with tiny silver dots, appear to be in melting motion in this abstract piece. A great place for your earrings, rings, or watch at the end of the day...or place it where everyone can enjoy it! Free shipping. Not food safe, clean with damp cloth, do not put in dishwasher. 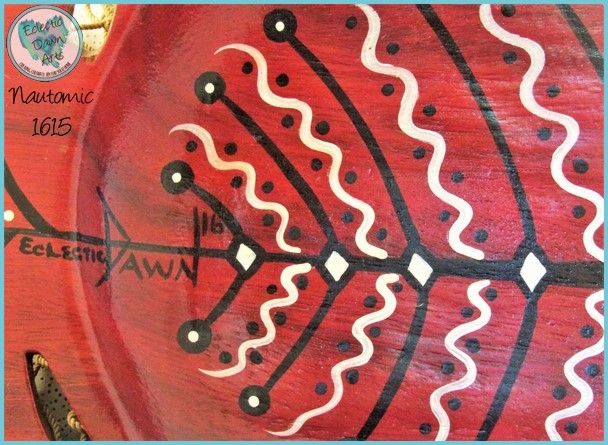 #TB1711 : 'EYES' Trinket Tray or Decorative Bowl (accessories not included), ~12 x 7 inch, 2 section off-kilter "soft" rectangle (sizes are approximate due to the organic shapes). Wild eyes in a mod or pop art style. If your home has retro touches or an urban loft style, this will make a great accent piece or a place to set your keys at the end of the day! White, black, and orchid purple vivid graphic line and polka dot design. Free shipping. Not food safe, clean with damp cloth, do not put in dishwasher. 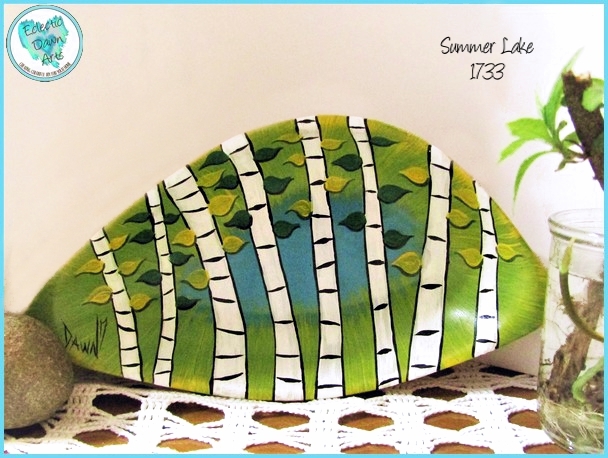 #TB1733 : 'Summer Lake' Decorative Bowl (accessories not included), ~10 x 5.25 inch ovoid (sizes are approximate). Remember those summers at the lake resort, dirty dancing with your crush? 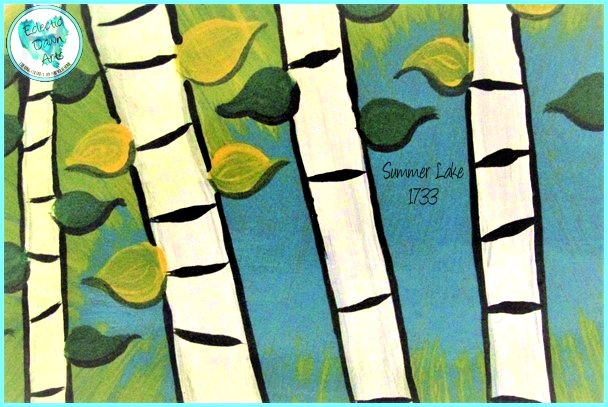 Here's our MidCentury take on birch trees at the lake, ready to bring a splash of summer color to your home! 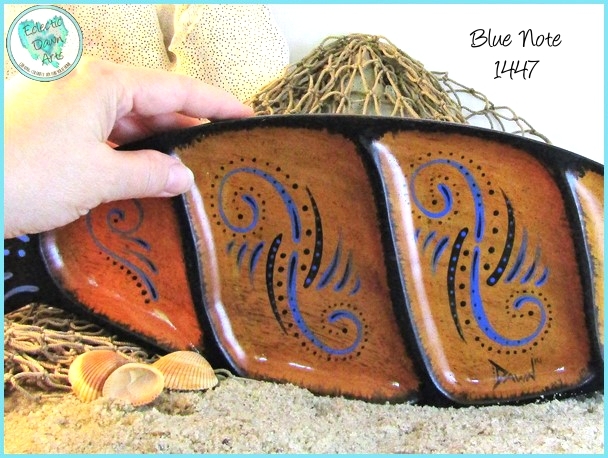 This handpainted wooden bowl is a lovely place to set your watch at the end of the day. A great gift for the outdoorsy type or someone who loves retro style. Free shipping. Not food safe, clean with damp cloth, do not put in dishwasher. 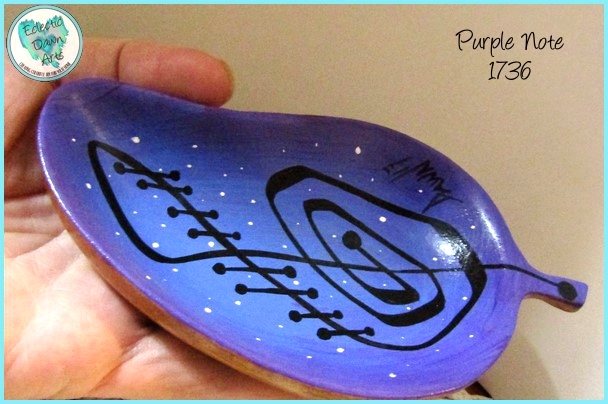 #TB1736 : 'Purple Note' Trinket Tray/Ring Keeper, SIZE: approx. 5.5 x 3 inch. 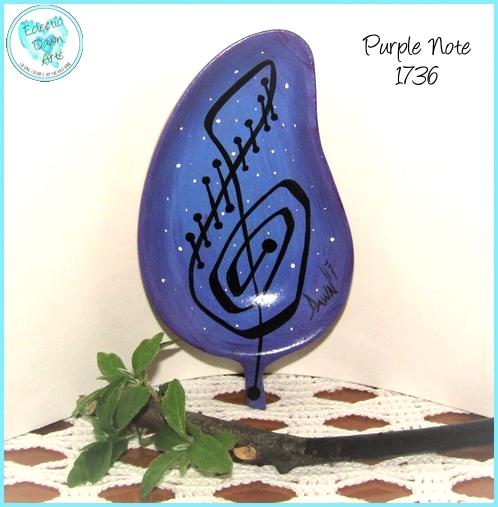 A stylized, rather MidMod abstract treble clef on a purple raining background calls to mind amazing artists and amazing music...unique sounds represented by a unique piece. A wonderful gift for a music lover, which can be used as a pick keeper, a ring keeper, or just for admiring. Free shipping. Not food safe, clean with damp cloth, do not put in dishwasher.